Image: the last chamber of the cave is also the biggest one. Open: MAR Sat, Sun, Hol 9-17. APR to OCT daily 9-17:30. NOV, Sat, Sun, Hol 9-17. Fee: Adults EUR 4, Reduced EUR 3, Children (6-14) EUR 2.50, Children (0-5) free, Family (2+*) EUR 10. Groups (20+): Adults EUR 3, Children (6-14) EUR 2. Guided tours: L=380m, D=30min, V=54,000/a , self guided tours. 1517 first part of the cave discovered on the vicinity of the village Genkingen. 04-AUG-1803 visited by the Kurfürst Friedrich I. von Württemberg. 1803 first developed by the Kurfürst Friedrich I. von Württemberg. 1920 discovery of new parts by Kopp and Rau. Since the first visit by the sovereign Kurfürst Friedrich I. von Württemberg in 1803, the traditional Nebelhöhlenfest (Fog Cave Festival) is celebrated on Whitmonday. Image: this stalagmite was cut off. 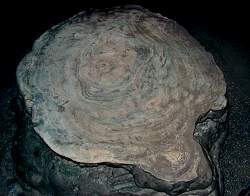 The intersection show the interior of a stalagmite, numerous concentric layers with different colours. The Fog Cave is famous for its numerous formations. But unfortunately the early and numerous visits with torches as light source, produced a lot of grime, covering the formations. But since 1924, when the electric lighting was installed in the cave, the formations grow undisturbed and many of them have a bright surface again. The black grime underneath a thin cover of calcite gives the cave a strange look. 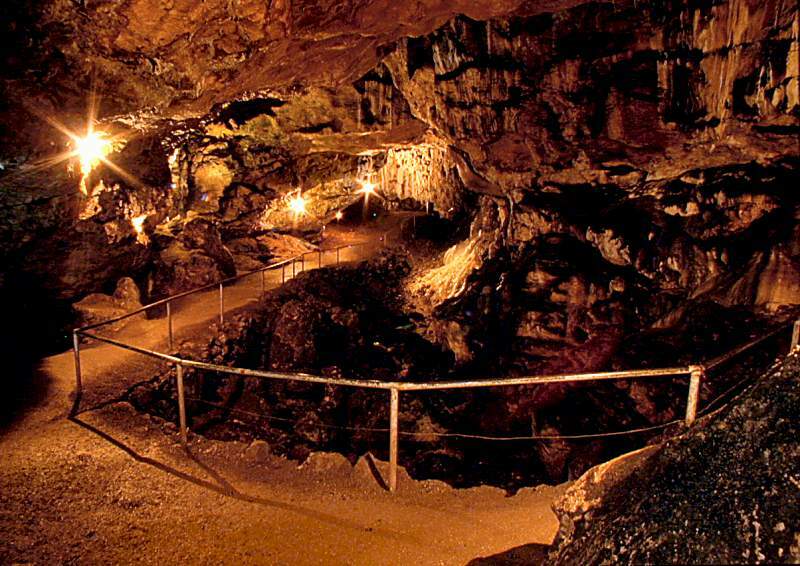 A huge stalagmite in the cave was cut and polished after World War II. The rock, which looks similar to marble, was used to make a wall cover in the Stuttgarter Schloß (Stuttgart Castle). The remaining trunk of the stalagmite has a plain surface, showing the inside of it. It looks like the rings of a tree, but this rings do not represent single years. They are formed by changes in the water supply and the content of iron oxide in water. 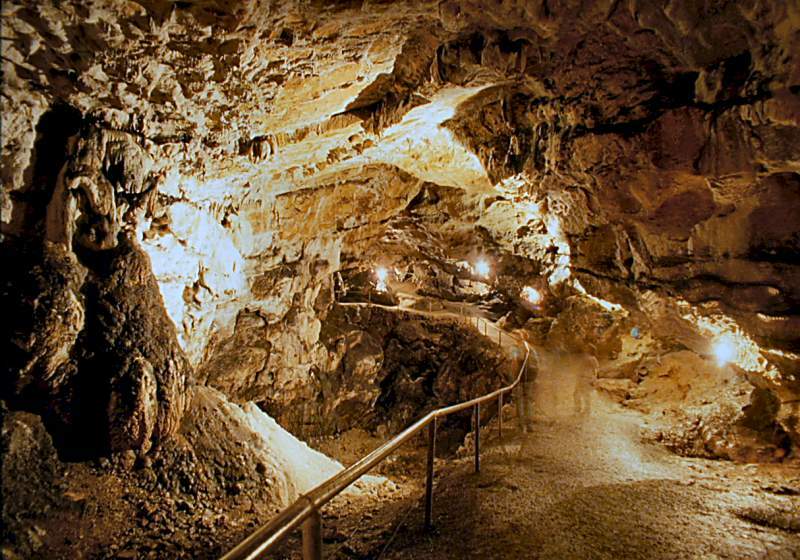 According to a legend, Herzog Ulrich von Württemberg used this cave as a hideout many years ago. In his 1826 published novel Lichtenstein, the author Wilhelm Hauff (*29.11.1802, +18.11.1827) mixes true historic facts and fiction producing a stirring adventure story. Wilhelm Hauff published also a famous collection of fairy tales. His life and his importance for the area is shown in the Wilhelm-Hauff-Museum in nearby Lichtenstein-Honau (Sat, Sun, Hol 14-17 and after prior arrangement, Tel: +49-7129-4277). Nebelhöhle by Tony Oldham (1965).